The cover art for the hardcover collection of the original Watchmen. 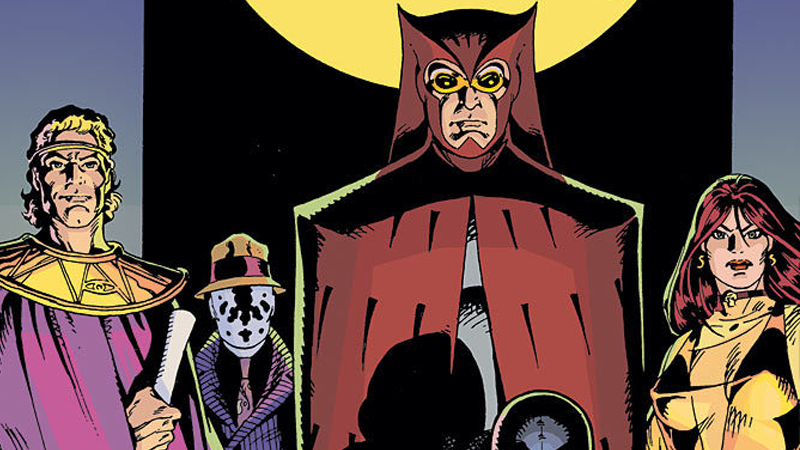 Damon Lindelof recently penned a lengthy letter to fans explaining that his Watchmen television show for HBO would be set in a world that exists after the events of Alan Moore and Dave Gibbons’ beloved comic series. Now, an early set photo might have revealed just how different that world is. Set pictures sent to /Film from where the project is shooting in Macon, Georgia offer some very intriguing glimpses of a world after Ozymandias helped summon a psychic alien terror right on top of New York City. Signposts directing the public to the location of Alien Shelters dot the streets everywhere, and a redesigned version of the American flag on the back of the car hints at some major political landscape changes in the wake of Watchmen’s climax. But it’s an apparent newspaper headline that raises the most questions, because the paper alleges that Ozymandias himself—better known by his public alias of Adrian Veidt—has been declared dead. Alleged set dressing from HBO’s Watchmen show. There’s not enough detail beyond the headline to know if this is in relation to the attack on New York, or (more likely) an entirely separate incident. Did he die of natural causes, or was Veidt killed? Did the grand secret that he was behind the attack on New York ever get out, or did it die with him? It could also be an elaborate ruse, of course—but it might be our first confirmation of the fate of one of Watchmen’s most important characters in this new show’s status quo. But it’s also interesting because right now, DC Comics is doing is own spin on a post-Watchmen continuity in the pages of Geoff Johns, Gary Frank, and Brad Anderson’s Doomsday Clock, and that series is taking a very-much-still-alive Veidt in a completely different direction. Adrian Veidt is not a popular man in DC’s own interpretation of a post-Watchmen world. In Doomsday Clock’s post-Watchmen world, Veidt’s psychic monster plan only brings a few years of world peace. By the time the comic opens, nuclear tensions between the US and North Korea have reached a fever pitch, and chaos reigns in the US as Russia begins an invasion of Europe. All this happens because the secret of Veidt’s plan—dubbed “the great lie”—got out, turning the former hero into the most wanted man in America. Veidt has yet to be captured, though, and, now ailed with cancer, he launches a desperate plan (alongside some seriously creepy mime criminals and a new man wearing Rorschach’s mask) to find the reality where Doctor Manhattan swanned off to after Watchmen, in the hopes that he could help make things right in a way Veidt couldn’t. If these set pictures pan out, and in the world of HBO’s Watchmen Veidt is really dead—after all, it could even be fake set dressing to get fans speculating—it’ll be interesting to see just how Lindelof’s show tackles the loss of one of Watchmen’s biggest characters. Doomsday Clock is starting to show what interesting things could be done with Ozymandias in the wake of his grand plan, but a world in which he is specifically absent could raise just as many intriguing opportunities. To see the rest of the set pictures, head on over to /Film. 'My name is Ozymandias, king of kings; Look on my works, ye Mighty, and despair!